In our past studies, we investigated into topics like the weekday your can save the most, or how long in advance you should book your cruise in a more general way. Today, we reveal that booking the respective cruise destination at the right time can realistically save you up to 71% off your cruise. For this study, we examined 18,983 sailings by region with departures in 2017, and found a surprising trend: as the date of departure approaches, cruise prices fluctuate to a greater extent. Some regions even show up to a 71% price reduction on fares. However, there are huge differences between destinations to keep in mind. If you’re wondering when to book a cruise to get the best price, you could soak up both the sun and the savings with short-term booking. Hawaii and Mexico are the best regions for this option. The best time to book Hawaiian cruises is 21 days before departure, and Mexican cruises can offer up to 46% off within 32 days prior to departure. The Caribbean is America’s favorite cruise region, and this popular playground boasts maximum price reductions of 51% off when you book around 59 days before departure. Furthermore, the trend extends to the nearby region of Bermuda, where maximum price reductions of 46% off happen exactly 51 days before cruises set sail. This means that cruise enthusiasts looking for a dose of Vitamin D can save around half off their trip by booking at the right time. Some regions maintain fairly consistent pricing, like Australia (35%), the South Sea (27%), and Alaska (19%). These regions see relatively small price fluctuations, and they tend to happen 85 days before departure. Transatlantic or Transpacific cruises (41% off 73 days pre-departure). 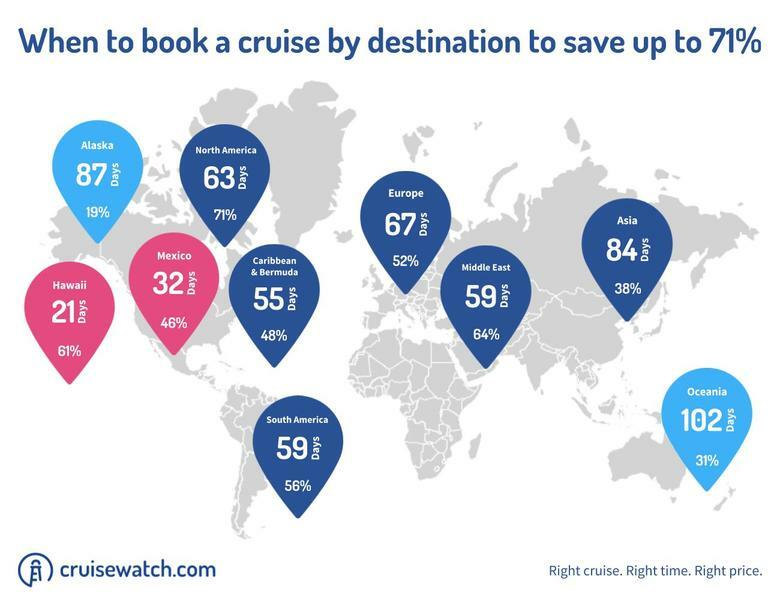 While these regions may not offer as extreme price drops as Hawaii or the Caribbean, knowing when to take a cruise to these locations can still save consumers a significant amount of money. Unlike other cruise or booking sites, we focuses on keeping things clear, simple, and personalized for you. Our service offers 100% free, automatic updates on when to book a cruise for the best price. We also regularly conduct research to find new insights for cruisers. “We are levelling the playing field and offering consumers up-to-date technology to make the middle decisions”. Interested in staying with us? Register now and configure your personal cruise alert – it’s free.